You’re in Hoxton of a Thursday evening. It’s time for dinner. One of two things is probably true: either you’re a hipster, so you don’t eat (they’re not called chubby jeans after all) or you’re in a Vietnamese restaurant, disappointed that you couldn’t bring your own booze (word of mouth lied to you! ), flinching under the unrelentingly bright lights but satisfied by the crunchy chilli mango treats. You now have a third option, courtesy of the fellows behind DJ outfit Krankbrother, Danny and Kieran Clancy. Danny has already established his restaurant credentials by co-founding Bonnie Gull in Fitzrovia and together they’ve turned three vacant arches beneath Hoxton station into a smart, handsome restaurant and bar. Paint peels from the alley walls outside, creative beardy types in constrictive trousers funnel in and out of the station, and as we hunker down in the bar a pink sun sinks behind the Geffrye Museum. Inside, the arches are in wonderful condition and the brickwork is strewn with lanterns, chalkboards and such. The shuttered counter reinforces the train station aesthetic, and with the dim light, the frequent rumblings overhead and the general hubbub and bonhomie, it’s not unlike a kind of hip WWII bomb shelter, with everyone huddled in the near-dark enjoying each other’s company. There’s a smokehouse out back, the fruits of which litter the menu. A man sits in the corner waiting for his dining partner, wearing a three-piece velvet suit, passing the time by stroking his twirl-length ‘tache. We take up a position with our backs to the brick wall and get to the starters. The wild seabass ceviche has a refreshing jolt of lime, and spreads out under a pile of delicately shaved fennel. It certainly fires up the taste buds, although there’s no doubt that my dining partner ordered better. 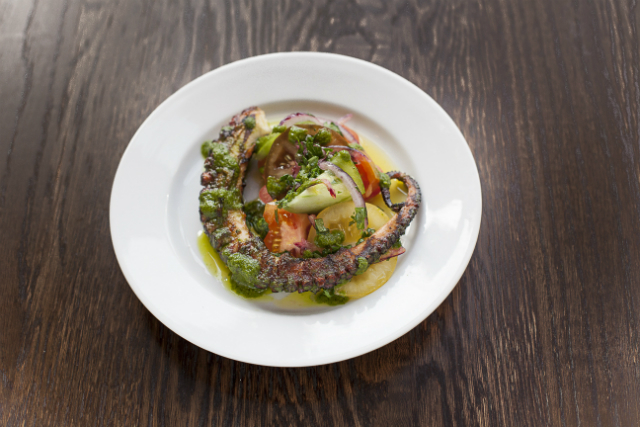 Her grilled octopus sits on heirloom tomatoes and is drenched in coriander. The tentacles’ ends are blackened just enough to offer that brittle smokiness, while still tasting fresh. It’s a strong little dish, immensely satisfying and with a lingering flavour to keep us occupied until the mains. Perhaps just to remind me of the bunker-meets-restaurant vibe, the lights dip dramatically just before the mains arrive. 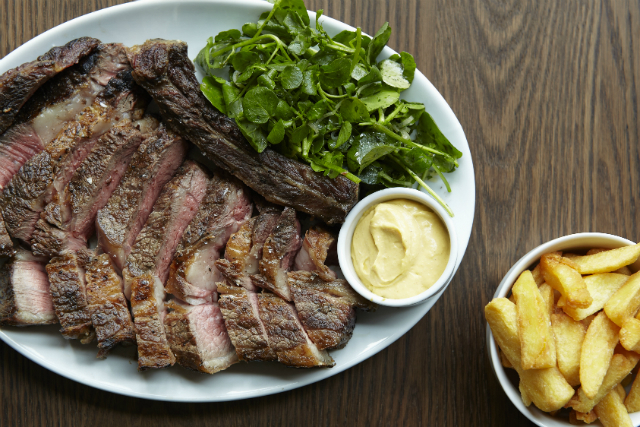 Beagle offers aged short-horn forerib in chunks sized for sharing (£92 for the largest), but that’s a lot of meat and we can’t quite agree on how greedy we are. Instead I head to the specials board for the grilled mutton chops with runner beans and anchovy. This is a proper dish for the end of British Summer Time – I feel warmer just looking at it – and the runner beans are comfortingly creamy, with that salty maritime undercurrent that keeps me reaching for the wine bottle. The chops themselves aren’t spectacular but the flavours are deep and the meat is moist. Meanwhile, across the table, the braised hare pappardelle is going down a storm, with soft sheets of pasta unfolding around extremely generous amounts of rich, tender, juicy meat. We try the duck fat chips, a glorious bucket of crunch, and the lights dip again. Perhaps it’s the trains up top, but it all adds to the spectacle. There’s a smaller, beautifully lit arch leading from the dining area to the kitchen, and by the time we reach the dessert, enough smoke has drifted in to lend the room a shady, speakeasy quality. The velvet fellow looks right at home. All that’s left is the ‘queen of desserts’ – soft meringue on top, a mixed berry compote in the middle and baked custard on the bottom. It’s a hot mess, and there’s much clinking of spoons as we race to the bottom of the dish. I find it extremely difficult not to stop for a cocktail on the way out, as the bar area is just so fetching, but there’s another day to navigate till the weekend, so I leave the bunker and head upstairs to the station. I’ll be back, though. 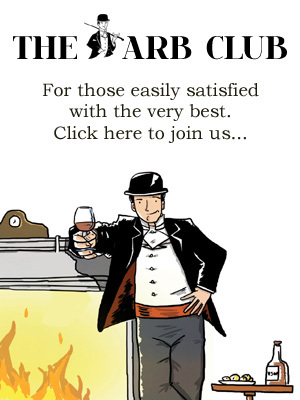 One could easily spend hours in those arches, making merry with all that meat. 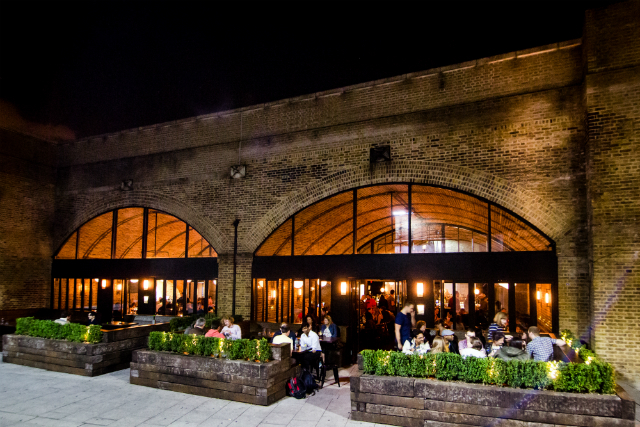 For hipster-approved dining with a little sophistication, you’ll struggle to find a better spot. Beagle, 397-400 Geffrye Street, Hoxton, London E2 8HZ. Website.